Ideally located just off the elegant Avenue Louise, Le Beau site offers a welcoming alternative be it for business or pleasure. It is only steps away from museums, art galleries and fashionable restaurants. 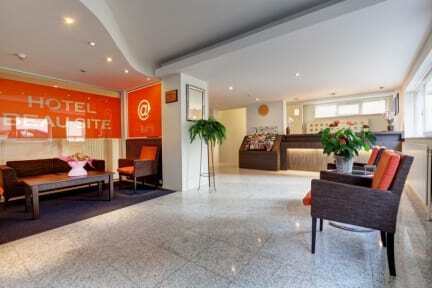 The hotel is also within easy reach of Brussels' European Institutions and Congress Centre. Our club room is tailor-made for the discerning traveller. All club rooms feature minibar, direct-dial telephone, cable TV and modem connection. The en suite bathrooms have bathtubs and hair dryers. Our larger executive room is the perfect choice for a comfortable stay and provides the ideal retreat after a day's shopping. These rooms have spacious wardrobe areas and come double or twin-bedded. The well appointed bathrooms feature bathtubs and hair dryers. Most benefit from natural light. All executive rooms also feature convenient workspace, and all the same amenities as the club rooms. You can start the day with our complimentary buffet breakfast. Parking spaces available upon reservation : 15.00 Euros per night . Roll away and baby beds are also available upon request. Safety deposit boxes are available at the Reception. The hotel also provides luggage storage and fax / copy service.